Our rivers are beautiful places. They also have important work to do – delivering water to towns and farms, and nourishing whole ecosystems along the way. 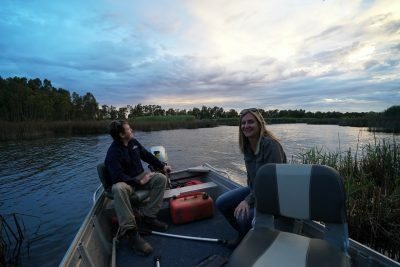 OEH staff keep a close eye on wetlands and rivers throughout NSW. Photo V Bucello. Striking a balance to maintain a healthy, productive river is the subject of a new video now available on the Office of Environment and Heritage website. ‘Your river at work : Finding the balance’ tells the story of NSW rivers and the important role they play in sustaining local communities – plants, animals and people. OEH is playing a central role in managing water to support specific ecological outcomes for rivers, creeks and wetlands across the state. Working in partnership with local communities, OEH is delivering water to rivers and wetlands on public and private land to support native fish, waterbirds, frogs and other water dependent fauna. Providing healthy habitat is a key component of OEH’s work, delivering water where and when it is needed to meet the lifetime requirements of native animals. The short video (3 minutes) provides an introduction to the role of rivers in inland NSW and the important networks they create. The video can be viewed below, or by clicking here. For more information about the role of OEH in supporting productive, healthy wetlands, explore the website http://www.environment.nsw.gov.au/environmentalwater/what-is-it.htm .